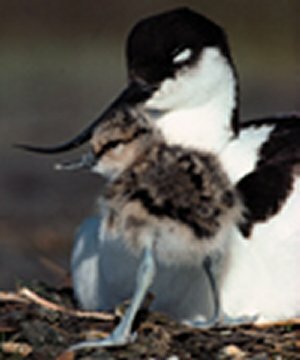 The Group studied chick survival at a number of sites on the Norfolk coast during the 1990's. All were colour ringed with 2 colours on the tibia of one leg and a yellow over metal ring on the tibia of the other leg. Lots of sightings of our colour ringed birds have occurred, Many of them in the south-west on the Tamar Estuary where many Avocets are known to winter. Others have been seen in France and in Holland. Colour ring sightings provide some fascinating life histories of individual birds. Maps of Avocet recoveries and colour ring sightings. Many of these Avocets have set new longevity records for this species. If you see a colour ringed Avocet you can find out if it was ringed by us at http://www.cr-birding.org/ where you can also find our contact details if your sighting matches one ringed by us.